Canadians can order a print copy from Annette for $12.99 plus $5.00 shipping. "You will never understand what it means to be fat." With those words, grad student Robbie Smith begins the Fat-Like-Me project. In order to support her thesis, she puts on a fat suit to measure people's reactions to the new her. Accused of embezzling funds, Professor Jake Proctor returns home to spend quality time with the only father he has ever known. There, he meets an intriguing overweight woman who reminds him of his late grandmother. She's witty, charming, and cares deeply for those around her, including his dying grandfather. When Robbie meets Jake while she's in disguise, she deceives him for all the right reasons. 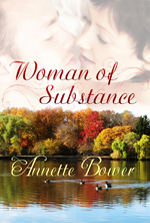 But how long can she maintain the deception before Jake discovers that she is not who he believes her to be?